This article is about the city in Slovenia. For other uses, see Maribor (disambiguation). Maribor (pronounced [ˈmaːɾibɔɾ] ( listen), German: Marburg an der Drau) is the second-largest city in Slovenia and the largest city of the traditional region of Lower Styria. It is also the seat of the City Municipality of Maribor. Maribor, along with the Portuguese city of Guimarães, was selected the European Capital of Culture for 2012. Maribor was attested in historical sources as Marpurch circa 1145 (and later as Marchburch, Marburc, and Marchpurch), and is a compound of Middle High German march 'march (borderland)' + burc 'fortress'. In modern times, the town's German name was Marburg an der Drau (pronounced [ˈmaɐ̯bʊɐ̯k ʔan dɐ ˈdʁaʊ̯]; literally, 'Marburg on the Drava'). The Slovene name Maribor is an artificial Slovenized creation, coined by Stanko Vraz in 1836. Vraz created the name in the spirit of Illyrianism by analogy with the name Brandenburg (cf. Lower Sorbian Bramborska). 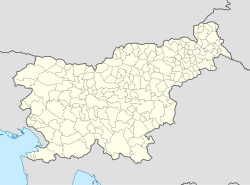 Locally, the town is known in Slovene as Marprk or Marprog. In addition to its Slovene and German names, the city is also known as Marburgum in Latin and Marburgo in Italian. Maribor in the 17th century. A copper engraving by Georg Matthäus Vischer, 1678. In 1900, the city had a population that was 82.3% Austrian Germans and 17.3% Slovenes (based on the language spoken at home); most of the city's capital and public life was in Austrian German hands. Thus, it was mainly known by its Austrian name Marburg an der Drau. According to the last Austro-Hungarian census in 1910, the city of Maribor and the suburbs Studenci (Brunndorf), Pobrežje (Pobersch), Tezno (Thesen), Radvanje (Rothwein), Krčevina (Kartschowin), and Košaki (Leitersberg) was inhabited by 31,995 Austrian Germans (including German-speaking Jews) and only 6,151 ethnic Slovenes. The surrounding area however was populated almost entirely by Slovenes, although many Austrian Germans lived in smaller towns like Ptuj. During World War I many Slovenes in the Carinthia and Styria were detained on suspicion of being enemies of the Austrian Empire. This led to distrust between Austrian Germans and Slovenes. After the collapse of the Austrian-Hungarian Empire in 1918, Maribor was claimed by both the State of Slovenes, Croats and Serbs and German Austria. On 1 November 1918, a meeting was held by Colonel Anton Holik in the Melje barracks, where it was decided that the German-speaking city should be part of German Austria. Ethnic Slovene Major Rudolf Maister, who was present at the meeting, denounced the decision and organised Slovenian military units that were able to seize control of the city. All Austrian officers and soldiers were disarmed and demobilised to the new state of German Austria. The city council then held a secret meeting, where it was decided to do whatever possible to regain Maribor for German Austria. They organised a military unit called the Green Guard (Schutzwehr), and approximately 400 well-armed soldiers of this unit opposed the pro-Slovenian and pro-Yugoslav Major Maister. Slovenian troops surprised and disarmed the Green Guard early in the morning of 23 November. Thereafter, there was no threat to the authority of Rudolf Maister in the city. On 27 January 1919, Austrian Germans gathered to await the United States peace delegation at the city's marketplace were fired upon by Slovenian troops, who apparently feared the thousands of ethnic German citizens. Nine citizens were killed and some eighteen were seriously wounded; who had actually ordered the shooting has never been unequivocally established. German sources accused Maister's troops of shooting without cause. In turn Slovene witnesses such as Maks Pohar claimed that the Austrian Germans attacked the Slovenian soldiers guarding the Maribor city hall. Regardless of who was responsible, the Austrian German victims all had been without any arms. The German-language media called the incident Marburg's Bloody Sunday. After 1918, most of Maribor's Austrian Germans left the Kingdom of Slovenes, Croats and Serbs for Austria. These included the German-speaking officials who had not been from the region. Austrian German schools, clubs, and organizations were ordered closed by the new state of Yugoslavia, even though ethnic Germans still made up more than 25% of the city's total population as late as the 1930s. A policy of cultural assimilation was pursued in Yugoslavia against the Austrian German minority similar to the Germanization policy followed by Austria against its Slovene minority in Carinthia. However, in the late 1930s the policy was abandoned and the Austrian German minority's position improved significantly in an attempt to gain better diplomatic relations with Nazi Germany. Adolf Hitler on the Old Bridge in Maribor, Yugoslavia in 1941. On 26 April Adolf Hitler, who encouraged his followers to "make this land German again", visited Maribor and a grand reception was organised in the city castle by the local Germans. Immediately after the occupation, Nazi Germany began mass expulsions of Slovenes to the Independent State of Croatia, Serbia, and later to the concentration and work camps in Germany. The Nazi goal was to re-Germanize the population of Lower Styria after the war. Many Slovene patriots were taken hostage and some are believed to have been shot later in the prisons of Maribor and Graz. This led to organised resistance by partisans..
Maribor was the site of a German prisoner-of-war camp from 1941-45 for many British, Australian, and New Zealand troops who had been captured in Crete in 1941. In 2012, Maribor saw the beginning of 2012–13 Maribor protests which spread into 2012–2013 Slovenian protests. During the year 2012 Maribor was one of two European Capitals of Culture. The following year Maribor was the European Youth Capital. The city of Maribor divides into 11 districts (Slovene: mestne četrti) of the City Municipality of Maribor. The Drava River separates the districts of Center, Koroška Vrata, and Ivan Cankar to the north from other districts south of it. The various city districts are connected by four road bridges, a rail bridge and a pedestrian bridge. Maribor has a humid continental climate (Köppen climate classification: Dfb), bordering on oceanic climate (Köppen: Cfb). Average temperatures hover around zero degrees Celsius during the winter. Summers are generally warm. Average temperatures during the city's warmest month (July) exceed 20 degrees Celsius, which is one of the main reasons for the Maribor wine tradition. The city sees on average roughly 900 mm (35.4 in) of precipitation annually and it's one of the sunniest Slovene cities, with an average of 266 sunny days throughout the course of the year. The most recent temperature heatwave record for August is 40.6 °C, measured at the Maribor–Tabor weather station by the Slovenian Environment Agency (ARSO) on 8 August 2013. In 2008, the Studenci Footbridge (Studenška brv) was renovated according to the design of the Ponting company. The design was awarded that year at the 3rd International Footbridge Conference in Porto. In 2010, Maribor organised an international architectural competition ECC Maribor 2012 – Drava 2012 to gather proposals for the design and reconstruction of the Drava banks, the construction of a new art gallery, and for a new footbridge. Its jury received about 400 proposals for the three different projects. The footbridge and the river embankments will be built in the near future, but the art gallery was replaced with a cultural center MAKS, which is currently under construction. The construction of a new modern Faculty of Medicine started in 2011 near the Drava River. It was designed by architect Boris Podrecca and was completed in 2013. There are plans to renovate the Maribor Public Library and Town Hall Square (Rotovški trg). In addition, the renovation of Maribor Island (Mariborski otok) in the Drava River has been planned. Jewish people living in Maribor were first mentioned in 1277. It is suggested that at that time there was already a Jewish quarter in the city. The Jewish ghetto was located in the southeastern part of the city and it comprised, at its peak, several main streets in the city centre including part of the main city square. The ghetto had a synagogue, a Jewish cemetery and also a Talmud school. The Jewish community of Maribor was numerically at its apex around 1410. After 1450 the circumstances changed dramatically: increasing competition that coincided with an economic crisis dealt a severe blow to the economic activities that were crucial to their economic success. According to a decree issued by Emperor Maximilian I in 1496, Jews were forced to leave the city of Maribor. Restrictions on settlement and business for Jews remained in place until 1861. From late spring 1941, after Lower Styria was annexed by the Third Reich, the Jews of Maribor were deported to concentration camps. The more-than-400-year-old Žametovka grapevine growing outside the Old Vine House in Maribor. Right of it grows a daughter grapevine that has been cut from it. Maribor is known for wine and culinary specialities of international and Slovene cuisine (mushroom soup with buckwheat mush, tripe, sour soup, sausages with Sauerkraut, cheese dumplings, apple strudel, special cheese cake called gibanica). There are also many popular restaurants with Serbian cuisine. The Vinag Wine Cellar (Vinagova vinska klet), with the area of 20.000 m2 (215.28 sq ft) and the length of 2 km (1 mi), keeps 5,5 millions litres of wine. The house of the oldest grapevine in the world (Hiša stare trte) at Lent grows the world's oldest grapevine, which was in 2004 recorded in Guinness World Records. The grapevine of Žametovka is about 440 years old. Maribor is the hometown of the association football club NK Maribor, playing in the Slovenian PrvaLiga. NK Maribor has won the domestic title 14 times and has participated in the UEFA Champions League group stages three times, in the 1999–2000, 2014–15, and 2017–18 seasons. The club's home ground is Ljudski vrt, located in the Koroška Vrata district. In November 2012, Maribor hosted the World Youth Chess Championship with Garry Kasparov as the guest-of-honour. It was presumed that Maribor would also host the XXVI 2013 Winter Universiade but the Government of Slovenia refused any financial support for this project due to major financial problems. As a result, the International University Sports Federation decided that it would organise the Universiade elsewhere. ^ "Nadmorska višina naselij, kjer so sedeži občin" [Height above sea level of seats of municipalities] (in Slovenian and English). Statistical Office of the Republic of Slovenia. 2002. Archived from the original on 2012-11-25. ^ "Naselje Maribor". Statistical Office of the Republic of Slovenia. Retrieved February 17, 2018. ^ Snoj, Marko. 2009. Etimološki slovar slovenskih zemljepisnih imen. Ljubljana: Modrijan and Založba ZRC, p. 252. ^ "Castrum Marchburch, 850 let od prve omembe Maribora" [Castrum Marchburch, 850 Years Since the First Mention of Maribor]. MMC RTV Slovenija (in Slovenian). 14 October 2014. ^ Jozo Tomasevich (31 January 2001). War and Revolution in Yugoslavia, 1941-1945: Occupation and Collaboration. War and revolution in Yugoslavia, 1941-1945. 2. Stanford University Press. p. 85. ISBN 978-0-8047-3615-2. ^ "Maribor 2012: Smrt je kosila tudi iz zraka". Zivljenjenadotik.si. Retrieved 2013-03-26. ^ "Kako so proslavili osvoboditev Maribora in ga znova postavili na noge" [How Maribor was liberated and rebuilt]. RTV Slovenija. 8 May 2015. Retrieved 12 May 2015. ^ "Zveza mariborskih športnih društev Branik". Zveza-msdbranik.si. Retrieved 14 September 2016. ^ Tomasevich, Jozo (2001). War and Revolution in Yugoslavia: 1941-1945. ^ "Evropska prestolnica mladih" (in Slovenian). Mb2013.si. Archived from the original on 2013-08-29. Retrieved 2013-09-02. ^ Kottek, M.; Grieser, J.; Beck, C.; Rudolf, B.; Rubel, F. (2006). "World Map of the Köppen-Geiger climate classification updated" (PDF). Meteorol. Z. 15 (3): 259–263. doi:10.1127/0941-2948/2006/0130. Retrieved 24 August 2012. ^ "Maribor Climate normals 1981-2010" (PDF). ARSO. Retrieved March 15, 2015. ^ "Slovenia-Maribor: Defence Towers". Maribor-pohorje.si. Retrieved 2013-03-26. 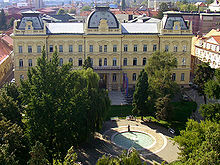 ^ University of Maribor site. ^ "Old vine in Maribor". Maribor-slovenia-travel-guide.com. Retrieved 2013-09-02. ^ "NK Maribor" (in Slovenian). NK Maribor official website. Retrieved 2013-09-02. ^ "Official website of Mariborsko Pohorje". Pohorje.org. Retrieved 2013-09-02. ^ "Kresanje mnenj o univerzijadi" [Clash of Opinions About the Universiade]. Delo.si (in Slovenian). 19 February 2012. ^ "Mariboru odvzeli univerzijado" [Universiade Taken Away from Maribor]. Slovenske novice (in Slovenian). 6 March 2012. ^ a b "Prijateljska in partnerska mesta" [Friendly and partner cities] (in Slovenian). www.maribor.si. Retrieved 4 March 2016.